Talks to extricate Britain from the European Union began in earnest Monday with both sides still seemingly far apart on citizens’ rights after Brexit officially takes place in less than two years. After an initial meeting last month where the structure of the talks was determined, Britain’s Brexit minister, David Davis, met up with the EU’s chief Brexit negotiator in Brussels ahead of four-days of discussions. Progress on citizens’ rights is one of the three main issues that have to be resolved before the two sides can start talking about a wide-ranging free trade deal, the others being the bill Britain has to pay to meet existing commitments and the border issue in Ireland. The British proposal offers EU nationals who have lived in Britain for at least five years – as of an unspecified cutoff date – the right to live, work and access benefits. The estimated 3 million EU nationals in Britain would all have to apply individually for permission to stay, and it’s unclear what the plan would mean for those who have been in the U.K. for a shorter time or what rights family members will have. European officials have said the British proposal to give EU citizens “settled status” does not go far enough. The European Parliament warned last week it could veto the final deal if Britain doesn’t give EU citizens more rights if they choose to stay in Britain after Brexit, which is due to take place in March 2019. The issue is the first to be tackled at four days of talks that started Monday. Whatever emerges will likely be replicated for the 1 million or so British citizens who currently live in EU countries. “It is incredibly important we now make good progress,” Britain’s Brexit minister David Davis said after launching the talks with chief EU Brexit negotiator Michel Barnier. Civil servants will do the bulk of the negotiating. 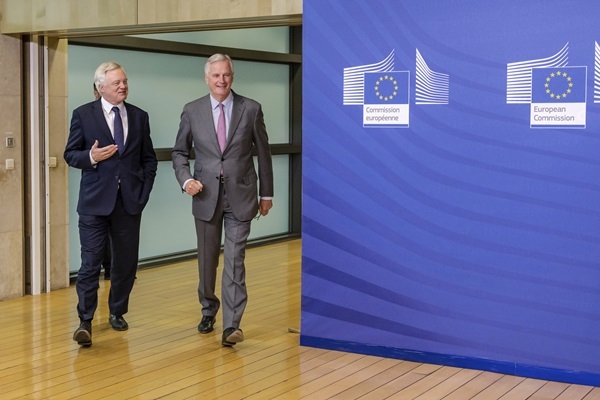 After opening the talks with Barnier Monday, Davis returned to London and is due back in Brussels Thursday for a press conference with the EU negotiator.